Around ZuZu’s Barn and it brought back many memories from the early days when I was even more clueless about this social media stuff than I am today. If it wasn’t for my Rhode Island friends, Rob Bentley and Peg Goter, I’d still be flailing around with no published posts to show for it. But, to date, this will be my 98th published piece, not including the five drafts that I thought the better of before pushing the button and the three I actually trashed for the greater good of all. 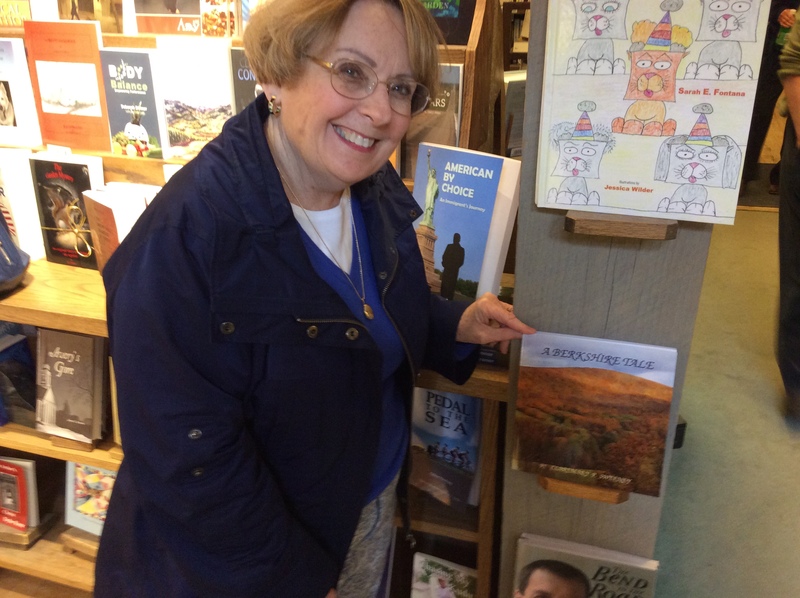 My first two entries in April, 2014 (which only a few people read because I only had seven followers – three of which were spammers) were filled with happy memories of Charley and me traveling to the Berkshires on my 66th birthday to collect my first book, A Berkshire Tale from Shirespress. I sang along with the radio all the way up to Manchester and Charley turned his hearing aids off. We went into Lenox and Stockbridge to the settings in the book and each place we visited wanted to put it into their gift shops: Tanglewood, where ZuZu first hears the summer music of the Boston Symphoney Orchestra in the air; The Red Lion Inn where the little Tabby meets Simon Treadway Gato, the Lobby Ambassador who introduces her to Santa Claus; The Berkshire Botanical Garden where ZuZu and her friend Nick learn about saving monarch butterflies; and the Hancock Shaker Village filled with history and stories of a long-ago past. Soon, we’ll be returning to the Berkshires to visit these places and bring them more books for the summer season. And I’ll be snapping photos to be used in future tales from the ZuZu series. The next book will be set in Stockbridge during Norman Rockwell Weekend and I’m also thinking of doing another about Baby Animals at the Hancock Shaker. I’ll take lots of pictures of the little ones to share with you in a future post. As I reread posts from the last two years, I realized how much has changed. Blog themes have progressed from reading with young children to much broader topics including: interesting places from our travels, baseball, music, art, photography, health and lately even politics. With those topic changes came new readers, although my original three spammers have stayed quite loyal and multiplied according to Akismet statistics. And many of those new readers have become old friends. Russ, a children’s author in California, has given me good advice from the first. Osyth takes me on journeys through France with her sidekick, Bean. Andy brings China into my little house in the woods of West Kingston. Clive offers humor from Great Britain. Ann shares her life in the Ukrain with her lovely videos. Melinda in Florida makes me laugh about her trials with staying organized. Joanne and I rant together about the Buffoon who is temporarily ensconced in the White House. Herb and I commiserate about the role of being advocates for our loved ones. Mary, in Scotland, understands this well, as she writes her book about her Dad’s dementia. Dennis, Thom, and ArtieQ bring music into my life. From Australia and New Zealand I’ve learn about nature from Robyn, bicycling from Gail, public speaking from Yvette. Jaqueline and Bernadette have shared space on their blogs every week for others to meet. Sharon takes us through the alphabet of the most interesting books to read, Martha gives us Broadway musicals from A-Z and Lynn gives us recipes and lessons on how to move from a frightening past to a hopeful future. And there are hundreds more bloggers who’ve spent many pleasant hours together with me in my Rhode Island home.. In the past two years, my own followers have grown from the original four friends and the three very loyal and persistent spammers to hundreds of people visiting me and leaving comments every week. People from all over the United Sates and 96 countries have come into my home and in return, I’ve traveled to their sites and learned so much by spending time with them. I’m truly grateful for everything they’ve added to my life and I thank them today and hope to spend more time with them in the future. During the New Year I have been quite remiss in keeping up with happenings in the blogosphere. They are an understanding group and know I’ve been working diligently to get my first mystery published by this June. Fellow bloggers who are authors and musicians, themselves, are most empathetic. They’ve been through those last few months of re-writes and edits needed before the launch into public view. So, now I will spend my afternoon editing additional information to be included in the mystery about the historic sites used as settings in Last Train to Kingston. And then, I’ll write another thousand words for the Last Rose on the Vine. Yes, I’m a glutton for punishment – I’ve already started the second mystery in the series. In the first book, the body is found on the bike path next to the local railway station. This time the body is found in the rose garden at the nearby college. So many bodies, so little time! Yesterday, I spent the morning with my friend Zack, who has done a great job designing the covers for Last Train and Carnivore Conundrum, the little verse book about the baby pitcher plant who decides to become a vegetarian. He is now working diligently on the illustrations for Carnivore and we’ll be launching that in the near future. Roxie loves Zack and has convinced him that his next job should be illustrating a book about her. I’m sure those of you who are members of the Roxie Dammit Fan Club are very happy to hear this. Roxie, ZuZu, Charley and I wish you all a lovely spring season and a very peaceful holiday. Take care and remember to stop and smell the roses. Be careful, though. There may be a dead body in the mulch and a killer lurking somewhere close at hand! Love the pictures. Looking forward to more of our flowers blooming! Good to see you back. Roxie deserves her Gazebo. Maybe soon? Looking forward to that post. Cats are very direct in their writing. You will not look good at all. She is preparing it as we speak and intends to read every single post you’ve written on your brood as background material. We’ll send it in a secret file…. I smiled so much reading your delightful post that my smile muscles began to hurt. The smiles started as soon as my email feed informed me you’d written another post. You didn’t disappoint. Congratulations on all the fun activities. I believe I’ve said this before, but I plan to buy your new book as soon as it’s available for sale. I await it with baited breath. (Why is it that the phrase “baited breath” always reminds me of the smell of fish bait?) ;-D! I wish you much continued success! Sarah, I just came in from working in the yard with Charley. Those photos are from last spring and I think it will be even more beautiful this year. It’s truly gorgeous outside and tomorrow, Easter Sunday, it’s supposed to be in the 80′. What a gift! Have a marvelous week. Nicely written, dear friend, and very flattered to be mentioned. Thank you indeed. There must be something about your part of the country that inspired, Inspiration comes from the Cathedral of Ideas. Write on. I have been very good about reading posts from bloggers also on my Face Book page, but very remiss with others. I’m glad you share your poetry with me. Take care, Herb and have a joyous week. Thank you Claremary. You write so well that I do try to follow regularly. I learn a lot from you. Herb, You are welcome, my friend. And I learn so much from you, too. Maybe, someday I’ll be a poet, too. But I still have a steep learning curve. This is such a great post… beautiful photos and words. We could relate to your note about your earlier post when you had only a few followers. We remembered when we started in September 2016 when we had only a couple followers and felt we had spent hours trying to figure the blogging thing out and nobody liked it, lol. Looking back we see it was a season of growing and learning and are soooooo thankful now for that season. Keep on posting for us. Happy Easter. The only thing I worry about now is having too many people and not being able to read all of their posts and comment. Keep on blogging and have a lovely week. We can understand the dilemma Claremary. It is so wonderful to have so many looking on and we so enjoy looking on to theirs. Some days there are not enough hours in the day. Somehow we do it though and are so happy we did. We are so amazed at how many gifted people we have connected with and there are more to come. Hi, Marty. Thanks! It was a very different method than writing the children’s stories. I had to keep timelines and clues close at hand so as not to give anything away. I hope it does well. Time will tell. I will definitely add it to my reading list, Claremary. Wow!! 2 years already?? Congrats, Ethel!! And thanks so much for the mention!! I love you!! Yes, he definitely should illustrate a book about Roxie! So, hurry and write it, ok??? See, Roxie, I’m advocating for ya, love!! Dearest Lucy. Of course I’d mention you. You are almost like my sister after all this time. Just like Lucy and Ethel! Happy Easter Sunday, my friend. Aww, thanks, Sis!! And to you! He is risen indeed! Yes, when I checked back, I see we were part of that 101 group. And I’m glad, too. So many have kept in contact. I was actually going to stop blogging last December but decided to at least do a post every month if I could. I think I’d really miss people and that seemed truly sad to think about. So, here’s to another year and who knows what it will bring, C.J. Have a lovely week! Yes, Charley and I do keep ourselves busy for two old coots! And I’m very glad to see that you’re getting back into the swing of it again. It is quite a beautiful day here in RI and it’s filling me with an attitude of gratitude. Thanks for stopping by, Robin. I’m astounded at how much you accomplish. Just to see the beautiful photos of the farm – how do you have time to manage a farm of such diversity and to write, travel, blog – ? You must never sleep. But please don’t start now – can’t wait to see more photos of your beautiful corner of the country. Congrats on your mystery publication – Last Train to Kingston is now on my TBR list. I think you gave me a shout-out here, so thank you for that. And, I have to mention that Word Press never alerts me about my blog anniversary with them – can’t figure out why I’ve been forgotten. Here’s wishing you and Charley and all the critters a wonderful spring around the barn and wherever else you wander. Happy Birthday to you, too, Sharon. I told you we were twins separated at birth. Now, about that farm. It only exists in my imagination and in the Berkshire Tales book. (I alluded to this on my About Me Page). The photos are taken in various places here in RI and in the Berkshires.. Tomorrow, I’m headed for Hancock Shaker Village in the Berkshires to get some shots of baby animals for use in a future ZuZu book set up there in the Village. Yes, that was definitely a shout-out to you and your wonderful blog. I’m not sure why WordPress doesn’t send you a notice. I still have final edit work to complete on the mystery before it’s printed and launched in late June (fingers crossed). But I’ve started the second mystery in the series and it’s coming along quite well. In this book, I am murdering off people modeled after 2 people I cannot abide (and I like pretty much everybody). It is very cathartic. I just came inside from planting colorful pansies into window boxes. It’s been a gorgeous day here in Rhode Island. I hope your day was lovely, too. Yayyyyyy! So you get your own Birthday Month. I think Fall is a fun time to celebrate. Soul mates! Yes, that is important. I’ll be by in a while. Lovely post and thanks for the mention. Here’s to your next two years blogging. I’m way behind with mine and have been on holiday to the island of Arran and am hoping to start getting back on top of things this coming week. Happy spring 🙂 I see our swallows have come back today. Congratulations Clare! Two years worth of posting under your belt, not to mention the growing list of books. I am so looking forward to ‘Last Train to Kingston’. And to think there is going to be a series! The spring garden photos are beautiful. There is something about the sharp seasonal contrasts one has living in a colder climate that I don’t get to experience here. I think my writing and plotting improved immensely after reading Louise Penny. Of course any reading is good for writing. I just love the idea of not having to lose well loved characters at the end of a book. Yes, and I also go to PD James when needed. Funny story: Our pastor loves Louise Penny and I told him one day that I sometimes read the end of mysteries ahead of time to make sure a favorite character will be still alive when I finish the book. Also, I like to read who dunnit and then read the mystery to check out how and when the clues are given. The pastor was appalled and said he would never read the ending of a mystery ahead of time. (The next week I gave him her newest book for his birthday and he was saving it to read in the summer while on vacation.) A few weeks later, , he told Charley he was going to have a cake (after service in Fellowship Hall) for Charley and me the next week because we had compiled a Church Directory for the congregation. I said, “No way!”. There were too many people in the church who’d done much more over the years. We were new to the church and had done only that one project. We did not deserve special recognition. He insisted there would be a cake. I then warned him that if there was so much as a cupcake with our names on it, I would tell him the ending of the newest Penny book I’d given him for his birthday. He went back to the Deacons and told them to cancel the cake. When they asked “Why?” he simply answered, “Clare is blackmailing me.” They accepted his explanation without further questions and there was no cake. Her newest book comes out in August, so he’d better stay on his toes! Right now I’m ready Donna Leon’s latest, Earthly Remains and am very impressed so far. I love great mysteries by women authors! Love the story Clare! Interesting the deacons felt no need to question? They know a serious threat when it’s issued? I will look up Donna Leon. I like P.D. James too. Yes, I workingt with teenagers all of my life. I know how to give a warning that is always heeded. I think you’ll love Leon’s books set in modern day Venice. Guiddo Bernetti and his family and co-workers become more interesting with every new book. This is her 26th. Happy anniversary Claremary. I am so very happy to have the privilege of reading your posts. Relax Claremary, you are doing just fine. Oh, dear Clare, how pleasant and flattering to be mentioned by you at your post, so flattering, thank you so much. Congratulations with you anniversary and many new followers that make your blogosphere life colorful. I am honored to meet you and your cute babies who bring us to their adventurous world. Happy holidays! Thank you for your good wishes. Time has gone by very fast these last two years. Yes, we seem to attract some of the same nice people. I think I met you from a comment left on Robyn’s page. I’m surprised at the people who continue to log on. I don’t really do anything to recruit more followers. I worry I won’t have time for the ones who’ve been with me for so long.I’m happy you’re here with me, too. Safe bicycling, my friend. Happy 2nd year blogging Anniversary Clare. Keep up the great work and you can add me to the waiting for the Roxie Dammit book club. Thanks, Dennis. Roxie thanks you and will be more than pleased to autograph it for you. Please tell Roxie that I’ll be looking forward to it. Happy blog anniversary! And thanks for the shoutout and the lovely photos, Clare. I love Midsomer Murders! Watch it every week. Lots of famous English stage actors as extras. I always pick the most famous of the cast to be the murderer. Actually, my neighbors are quite safe, it’s family members who are in grave danger! That’s usually the way it works! Been running for about 15 years, I think, so it really is a surprise that anyone gets out alive. Glad to hear your neighbours are alright though not so sure about your family! Ya gotta love this new, modern and kindly animal farm, right? And let the flowers bloom. Too bad they are so temporary. Love the colours. You should and scentorama. lol. Maybe WordPress or Face Book will figure out Scentorama. You need to patent that thought fast! Belated happy blogiversary! I missed doing my own one (for one year) but never mind. Blogging’s a good and often strange journey, don’t you find? Clare, I sent you an email, hope you got it – if not you won’t be able to read my blog as I’ve made it private. Thanks, my friend. I think I’ll have more confidence once the first book of the mystery series is launched. As I said, no family is without its trials. But when Charley was diagnosed with cancer and then given a few years to live, our priorities fell in line. We take good care of each other and cherish every day we’re given. The ogres in the fairytale have been put in their place and that makes our quality of life better. Thanks, Jacqueline, your visit and comment started my day off with a smile. Clare, congratulations! Long may the joy of your blog continue. To me it’s a model of how blogs and their owners change and develop over time. This morning, just seeing your magical photos made me smile — I have had a virtual dose of pure and vivid nature right here and now. Thanks, Rachel. I received notification today that I’d published my 100th post. Who’d a thunk I had that many words in me? I just might make it to three years and I hope I’ll be reading your comments forever.